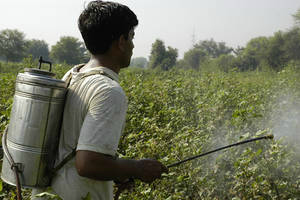 The UN’s agricultural organisation has urged governments in developing countries to ban a toxic pesticide – already outlawed in the European Union – linked to the deaths this month of more than 20 children in India. At least 23 children died on 17 July after eating school lunches cooked with oil with traces of the pesticide, investigators said. The Indian daily Express newspaper reported on Tuesday that the authorities had ignored dozens of complaints that children were becoming ill after eating meals provided through a government nutritional scheme. The World Health Organization has urged India to ban the sale of monocrotophos insecticide, citing risks to human health and wildlife and their use by impoverished farmers as a poison to commit suicide. Chemical pesticides and fertilisers are seen as essential ingredients in improving farm output but their use is highly controversial. Environmental groups contend they harm habits and the soil’s natural productivity, and cause air and water pollution. Under pressure from campaign groups, the EU recently banned several chemical pesticides linked to the decline in bee populations. Last week, the European Environment Agency warned that Europe’s butterfly populations were in danger of extinction in part because of intensive agricultural practices. In less developed countries, poor application of fertilisers and pesticides are seen as a culprit in damaging soil quality and groundwater supplies, as well as causing sickness in farmers who do not wear protective gear. The monocrotophos organophosphorus pesticide linked to the school childrens’ deaths in Bihar, India, is banned in the EU, United States and other nations. But they are still widely available in India. “The incident in Bihar underscores that secure storage of pesticide products and safe disposal of empty pesticide containers are risk reduction measures which are just as crucial as more prominent field-oriented steps like wearing proper protective masks and clothing,” the FAO said in a statement. “The entire distribution and disposal cycle for highly hazardous pesticides carries significant risks. Safeguards are difficult to ensure in many countries,” the Rome-based organisation said. Despite its warnings on the hazards of pesticides, the FAO has urged intensified farming practices and more investment in agriculture to meet anticipated population growth. In a recent report, it urged donors and their partners in developing countries to reverse a two-generation-long slide in farm investment to address food as well as nutritional needs in poor states. “The rationale for public investment in agriculture by governments and development partners rests on three interrelated benefits for society that can come from enhancing agricultural productivity: economic growth and poverty reduction, food and nutrition security, and environmental sustainability,” the FAO said in the report. The report highlights a sharp decline in investment and donor aid to agriculture, with farming as a share of aid falling from 18.8% in 1980 to 5.9% in 2010 in developing and middle-income countries. In sub-Saharan Africa, farm aid has slumped from 19.6% to 7.4% in the same period. "The mid-day meal programme is to ensure that children get sufficient and correct nutrition to grow into healthy adults. This shocking incident calls for urgent action from the Bihar government. It should ensure that safety and hygienic standards of mid-day meals and bring stronger regulations and restrictions of pesticide poisons." World Health Organization figures show that 3 million people are affected by intentional and unintentional pesticide poisonings every year. At least 300,000 people die from exposure to the chemicals, 99% of the cases occurring in developing and emerging countries. Monocrotophos is a highly hazardous organophosphate pesticide that is widely used in India. It has been most frequently associated with both accidental and intentional fatal pesticide poisonings, according to WHO findings. Very good laws and regulations in EU called REACH will guaranty good and safe control of chemical and REACH implications for developing countries as I am aware and am very interested in it is the best for developing nations to follow. As I mentioned somewhere else there are good regulations for pesticides/ chemicals in developed World but unfortunately regulations stop at the border and so people and environment in developing countries are faced with more exposure to toxic pollution and following REACH would solve the problem to some extent. Considering immense number of pesticides/ chemicals compounds, most synthetic and many toxic to life system, that has been in high usage during the past century and is continuing, now residues and metabolites of these chemicals are found in all food webs and habitats and changed whole process of evolution and coevolution that had been going for hundreds of millions years on this planet. The new and dangerous business of genetically engineered crops and other organisms is also added to the problem and whole life system on the planet is now under threat. The delicate system of speciation mechanisms responsible for creating the diversity of species and in particular for insects is now under real threat and surely cannot continue its natural way after this pollution scenario.